Location of the Rensselaer Polytechnic Institute in Troy, New York. — Stephen van Rensselaer of Albany to Samuel Blatchford of Lansingburgh. Rensselaer Polytechnic Institute (/rɛnsəˈlɪər/), or RPI, is a private research university and space-grant institution in Troy, New York, with additional campuses in Hartford and Groton, Connecticut. The institute was established in 1824 by Stephen van Rensselaer and Amos Eaton for the "application of science to the common purposes of life" and is described as the oldest technological university in the English-speaking world. Numerous American colleges or departments of applied sciences were modeled after Rensselaer. Built on a hillside, RPI's 265-acre (107 ha) campus overlooks the city of Troy and the Hudson River and is a blend of traditional and modern architecture. The institute operates an on‑campus business incubator and the 1,250-acre (510 ha) Rensselaer Technology Park. As of 2017, RPI's faculty and alumni include six members of the National Inventors Hall of Fame, six National Medal of Technology winners, five National Medal of Science winners, eight Fulbright Scholarship recipients, and a Nobel Prize winner in Physics; in addition, 86 faculty or alumni are members of the National Academy of Engineering, 17 of the National Academy of Sciences, 25 of the American Academy of Arts and Sciences, eight of the National Academy of Medicine, and nine of the National Academy of Inventors. Research projects include the areas of Astrobiology and Astrophysics, Biotechnology and Life Sciences, Energy, Environment, and Smart Systems (EES), Nanotechnology and Advanced Materials, Computational Science and Engineering, and Cognitive Engineering. Stephen Van Rensselaer established the Rensselaer School on November 5, 1824 with a letter to the Reverend Dr. Samuel Blatchford, in which Van Rensselaer asked Blatchford to serve as the first president. Within the letter he set down several orders of business. He appointed Amos Eaton as the school's first senior professor and appointed the first board of trustees. The school opened on Monday, January 3, 1825 at the Old Bank Place, a building at the north end of Troy. Tuition was around $40 per semester (equivalent to $800 in 2012). The fact that the school attracted students from as far as Ohio and Pennsylvania is attributed to the reputation of Eaton. Fourteen months of successful trial led to the incorporation of the school on March 21, 1826 by the state of New York. In its early years, the Rensselaer School strongly resembled a graduate school more than it did a college, drawing graduates from many older institutions. Under Eaton, the Rensselaer School, renamed the Rensselaer Institute in 1832, was a small but vibrant center for technological research. The first civil engineering degrees in the United States were granted by the school in 1835, and many of the best remembered civil engineers of that time graduated from the school. Important visiting scholars included Joseph Henry, who had previously studied under Amos Eaton, and Thomas Davenport, who sold the world's first working electric motor to the institute. In 1847 alumnus Benjamin Franklin Greene became the new senior professor. Earlier he had done a thorough study of European technical schools to see how Rensselaer could be improved. In 1850 he reorganized the school into a three-year polytechnic institute with six technical schools. In 1861 the name was changed to Rensselaer Polytechnic Institute. A severe conflagration of May 10, 1862, known as "The Great Fire", destroyed more than 507 buildings in Troy and gutted 75 acres (300,000 m2) in the heart of the city. The "Infant School" building that housed the Institute at the time was destroyed in this fire. Columbia University proposed that Rensselaer leave Troy altogether and merge with its New York City campus. Ultimately, the proposal was rejected and the campus left the crowded downtown for the hillside. Classes were temporarily held at the Vail House and in the Troy University building until 1864, when the Institute moved to a building on Broadway on 8th Street, now the site of the Approach. One of the first Latino student organizations in the United States was founded at RPI in 1890. The Club Hispano Americano was established by the international Latin American students that attended the institute at this time. In 1904 the Institute was for the fourth time devastated by fire, when its main building was completely destroyed. However, RPI underwent a period of academic and resource expansion under the leadership of President Palmer Ricketts. Named President in 1901, Ricketts liberalized the curriculum by adding the Department of Arts, Science, and Business Administration, in addition to the Graduate School. He also expanded the university's resources and developed RPI into a true polytechnic institute by increasing the number of degrees offered from two to twelve; these included electrical engineering, mechanical engineering, biology, chemistry, and physics. During Rickett's tenure, enrollment increased from approximately 200 in 1900 to a high of 1,700 in 1930. Another period of expansion occurred following World War II as returning veterans used their GI Bill education benefits to attend college. The "Freshman Hill" residence complex was opened in 1953 followed by the completion of the Commons Dining Hall in 1954, two more halls in 1958, and three more in 1968. In 1961, there was major progress in academics at the institute with the construction of the Gaerttner Linear Accelerator, then the most powerful in the world, and the Jonsson-Rowland Science Center. The current Student Union building was opened in 1967. The next three decades brought continued growth with many new buildings (see 'Campus' below), and growing ties to industry. The "H-building", previously used for storage, became the home for the RPI incubator program, the first such program sponsored solely by a university. Shortly after this, RPI decided to invest $3 million in pavement, water and power on around 1,200 acres (490 ha) of land it owned 5 miles (8.0 km) south of campus to create the Rensselaer Technology Park. 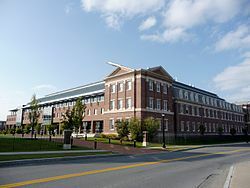 In 1982 the New York State legislature granted RPI $30 million to build the George M. Low Center for Industrial Innovation, a center for industry-sponsored research and development. In 1999, RPI gained attention when it was one of the first universities to implement a mandatory laptop computer program. This was also the year of the arrival of President Shirley Ann Jackson, a former chairperson of the Nuclear Regulatory Commission under President Bill Clinton. She instituted "The Rensselaer Plan" (discussed below), an ambitious plan to revitalize the institute. Many advances have been made under the plan, and Jackson has enjoyed the ongoing support of the RPI Board of Trustees. However, her leadership style did not sit well with many faculty; on April 26, 2006, RPI faculty voted 149 to 155 in a failed vote of no-confidence in Jackson. In September 2007, RPI's Faculty Senate was suspended for over four years over conflict with the administration. On October 3, 2008, RPI celebrated the opening of the $220 million Experimental Media and Performing Arts Center. That same year the national economic downturn resulted in the elimination of 98 staff positions across the Institute, about five percent of the workforce. Campus construction expansion continued, however, with the completion of the $92 million East Campus Athletic Village and opening of the new Blitman Commons residence hall in 2009. As of 2015, all staff positions had been reinstated at the Institute, experiencing significant growth from pre-recession levels and contributing over $1 billion annually to the economy of the Capital District. That same year, renovation of the North Hall, E-Complex, and Quadrangle dormitories began and was later completed in 2016 to house the largest incoming class in Rensselaer's history. RPI's 275-acre (111 ha) campus sits upon a hill overlooking Troy, New York and the Hudson River. The surrounding area is mostly residential neighborhoods, with the city of Troy lying at the base of the hill. The campus is bisected by 15th Street, with most of the athletic and housing facilities to the east, and the academic buildings to the west. A footbridge spans the street, linking the two halves. Much of the campus features a series of Colonial Revival style structures built in the first three decades of the 20th century. Overall, the campus has enjoyed four periods of expansion. RPI was originally located in downtown Troy, but gradually moved to the hilltop that overlooks the city. Buildings that remain from this time include Winslow Chemical Laboratory, a building on the National Register of Historic Places. Located at the base of the hill on the western edge of campus, it currently houses the Social and Behavioral Research Laboratory. President Palmer Ricketts supervised the construction of the school's "Green Rooftop" Colonial Revival buildings that give much of the campus a distinct architectural style. Buildings constructed during this period include the Carnegie Building (1906), Walker Laboratory (1907), Russell Sage Laboratory (1909), Pittsburgh Building (1912), Quadrangle Dormitories (1916–1927), Troy Building (1925), Amos Eaton Hall (1928), Greene Building (1931) and Ricketts Building (1935). Also built during this period was "The Approach" (1907), a massive ornate granite staircase found on the west end of campus. Originally linking RPI to the Troy Union Railroad station, it again serves as an important link between the city and the university. In 1906 the '86 Field, homefield of the football team until 2008, was completed with support of the Class of 1886. After World War II, the campus again underwent major expansion. Nine dormitories were built at the east edge of campus bordering Burdett Avenue, a location which came to be called "Freshman Hill". The Houston Field House (1949) was reassembled, after being moved in pieces from its original Rhode Island location. West Hall, which was originally built in 1869 as a hospital, was acquired by the Institute in 1953. The ornate building is an example of French Second Empire architecture. It was listed on the National Register of Historic Places in 1973. Another unique building is the Voorhees Computing Center (VCC). Originally the St. Joseph's Seminary chapel, built in 1933, the building was acquired by Rensselaer in 1958, and after renovation served as the institute's library from 1960 until the completion of the new Folsom Library, in 1976. The Folsom Library, located adjacent to the computing center, has a concrete exterior that was designed to harmonize with the light gray brick of the chapel; architecturally, it is an example of the modern brutalist style. Subsequently, the university was unsure of what to do with the chapel, or whether to keep it at all, but in 1979 decided to preserve it and renovate it to house computer labs and facilities to support the institute's computing initiatives. Today the VCC serves as the backbone for the institute's data and telephony infrastructure. The modern campus features the Jonsson-Rowland Science Center (J-ROWL) (1961), Materials Research Center (MRC) (1965), Rensselaer Union (1967), Cogswell Laboratory (1971), Darrin Communications Center (DCC) (1973), Jonsson Engineering Center (JEC) (1977), Low Center for Industrial Innovation (CII) (1987), a public school building which was converted into Academy Hall (1990), and the Center for Biotechnology and Interdisciplinary Studies (2004). Tunnels connect the Low Center, DCC, JEC and Science Center. A tenth dormitory named Barton Hall was added to Freshman Hill in August 2000, featuring the largest rooms available for freshmen. On October 3, 2008, the university celebrated the grand opening of the Experimental Media and Performing Arts Center (EMPAC) situated on the west edge of campus. The building was constructed on the precipice of the hill, with the main entrance on top. Upon entering, elevated walkways lead into a 1,200 seat concert hall. Most of the building is encased in a glass exoskeleton, with an atrium-like space between it and the "inner building". Adjacent to and underneath the main auditorium there is a 400-seat theater, offices, and two black-box studios with 35-foot (11 m) to 45-foot (14 m) ceilings. Originally budgeted for $50 million, the EMPAC construction costs ballooned to over $200 million due to difficulty of anchoring the foundation in the soft clay of the hill. In 2008, RPI announced the purchase of the former Rensselaer Best Western Inn, located at the base of the hill, along with plans to transform it into a new residence hall. After extensive renovations, the residence hall was dedicated on May 15, 2009, as the Howard N. Blitman, P.E. '50 Residence Commons. It houses about 300 students in 148 rooms and includes a fitness center, dining hall, and conference area. The new residence hall is part of a growing initiative to involve students in the Troy community and help revitalize the downtown. RPI owns and operates three office buildings in downtown Troy, the Rice and Heley buildings and the historic W. & L.E. Gurley Building. RPI also owns the Proctor's Theater building in Troy which was purchased in 2004, with the intention of converting it into office space. As of 2011, Rensselaer had signed an agreement with Columbia Development Companies to acquire both Proctor's Theatre and Chasan Building in Troy and launch a redevelopment. The Institute runs a 15-acre (6.1 ha) campus in Hartford, Connecticut, and a distance learning center in Groton, Connecticut. These centers are used by graduates and working professionals and are managed by the Hartford branch of RPI, Rensselaer at Hartford. At Hartford, graduate degrees are offered in business administration, management, computer science, computer and systems engineering, electrical engineering, engineering science, mechanical engineering and information technology. There are also a number of certificate programs and skills training programs for working professionals. Rensselaer Polytechnic Institute has five schools: the School of Architecture, the School of Engineering, the School of Humanities, Arts, and Social Sciences, the Lally School of Management & Technology, and the School of Science. The School of Engineering is the largest by enrollment, followed by the School of Science, the School of Management, the School of Humanities, Arts, and Social Sciences, and the School of Architecture. There also exists an interdisciplinary program in Information Technology that began in the late 1990s, programs in prehealth and prelaw, Reserve Officers' Training Corps (ROTC) for students desiring commissions as officers in the armed forces, a program in cooperative education (Co-Op), and domestic and international exchange programs. All together, the university offers over 145 degree programs in nearly 60 fields that lead to bachelor's, master's, and doctoral degrees. In addition to traditional majors, RPI has around a dozen special interdisciplinary programs, such as Games and Simulation Arts and Sciences (GSAS), Design, Innovation, and Society (DIS), Minds & Machines, and Product Design and Innovation (PDI). RPI is a technology-oriented university; all buildings and residence hall rooms have hard-wired and wireless high speed internet access, and all incoming freshmen have been required to have a laptop computer since 1999. In 2004, Forbes ranked RPI first in terms of wireless as the "most connected campus". Nationally, RPI is a member of the National Association of Independent Colleges and Universities (NAICU) and the NAICU's University and College Accountability Network (U-CAN). With the arrival of the president, Shirley Ann Jackson, came the "Rensselaer Plan" announced in 1999. Its goal is to achieve greater prominence for Rensselaer as a technological research university. Various aspects of the plan include bringing in a larger graduate student population and new research faculty, and increasing participation in undergraduate research, international exchange programs, and "living and learning communities". So far, there have been a number of changes under the plan: new infrastructure such as the Center for Biotechnology and Interdisciplinary Studies, Experimental Media and Performing Arts Center, and Computational Center for Nanotechnology Innovations (CCNI) have been built to support new programs, and application numbers have increased. In 2018, Rensselaer received a record number of applications: 20,337. According to Jared Cohon, president of Carnegie Mellon University, "Change at Rensselaer in the last five years has occurred with a scope and swiftness that may be without precedent in the recent history of American higher education." The ability to attract greater research funds is needed to meet the goals of the plan, and the university has set a goal of $100 million annually. Fourteen years later, in FY2013, research expenditures reached this goal. To help raise money the university mounted a $1 billion capital campaign, of which the public phase began in September 2004 and was expected to finish by 2008. In 2001, a major milestone of the campaign was the pledging of an unrestricted gift of $360 million by an anonymous donor, believed to be the largest such gift to a U.S. university at the time. The university had been a relative stranger to such generosity as the prior largest single gift was $15 million. By September 2006, the $1 billion goal has been exceeded much in part to an in-kind contribution of software commercially valued at $513.95 million by the Partners for the Advancement of Collaborative Engineering Education (PACE). In light of this, the board of trustees increased the goal of the $1 billion capital campaign to $1.4 billion by June 30, 2009. The new goal was met by October 1, 2008. In 2016, Shirley Ann Jackson, President of Rensselaer Polytechnic Institute, announced during the Fall Town Hall Meeting that the Institute was in the final stages of organizing a new capital campaign which it intends to launch in 2017 to meet the goals of the Rensselaer Plan 2024. The goal of the campaign was cited as being primarily for the support of financial aid for undergraduate students and the expansion of on-campus research facilities to accommodate planned increases in doctoral and graduate enrollment. The fundraising goal of the capital campaign is $1 billion, with over $400 million raised prior to the campaign going public. Ambitious spending on the Rensselaer Plan has led the University into financial difficulties, with its credit rating lowered by several agencies. Rensselaer is consistently ranked among the best universities in the United States and the world. For over a decade, Rensselaer has remained in the top fifty national universities in the United States, and is currently listed among the top six universities for highest median earnings. In 2017, U.S. News & World Report ranked Rensselaer 42nd among all colleges and universities and 31st for "Best Value" in undergraduate education. As of 2017, Rensselaer's undergraduate engineering program is ranked 30th and its graduate program is ranked 39th by U.S. News & World Report. Rensselaer's undergraduate and graduate engineering programs include Aerospace/Aeronautical (23rd), Biomedical (39th), Chemical (22nd), Civil (27th), Computer (27th), Electrical (26th), Environmental (34th), Industrial (17th), Materials (22nd), Mechanical (24th), and Nuclear (12th). In 2013, U.S. News & World Report ranked Rensselaer 6th for multimedia and visual communications. The same source ranked Rensselaer's computer science program 47th in the nation for graduates. The Leiden Ranking (2016) placed RPI at 127 among the top 900 world universities and research institutions according to the proportion of the top 1% most frequently cited publications of a university. In 2016, The Economist ranked Rensselaer #18 amongst four-year non-vocational colleges and universities and Times Higher Education–QS World University Rankings placed Rensselaer among the top 50 universities for technology in the world. In 2012, RPI was ranked as the 4th best engineering school in the world by Business Insider. The Newsweek/Kaplan 2007 Educational College Guide named Rensselaer Polytechnic Institute one of the 25 "New Ivies", a group of 25 schools described as providing an education equivalent to schools in the Ivy League. In 2017, Rensselaer was ranked 3rd in the U.S. by College Factual among all universities in physics. In 2015, Forbes ranked Rensselaer the 12th most entrepreneurial university in the world. The Lally School of Management and Technology is ranked 6th in technological entrepreneurship and 21st in entrepreneurship by Entrepreneur. The Lally School's corporate strategy program was ranked 11th in the nation by BusinessWeek and the management program was ranked 5th in the nation by TFE Times. Rensselaer is classified by The Carnegie Foundation for the Advancement of Teaching as a university with higher research activity. Rensselaer has established six areas of research as institute priorities: biotechnology, energy and the environment, nanotechnology, computation and information technology, and media and the arts. Research is organized under the Office of the Vice President for Research, Jonathan Dordick, who reports directly to the institute's president Shirley Ann Jackson. In 2018, Rensselaer operated 34 research centers and maintained annual sponsored research expenditures of $105 million. One of the most recent of Rensselaer's research centers is the Center for Biotechnology and Interdisciplinary Studies, a 218,000 square-foot research facility and a national pacesetter for fundamental and applied research in biotechnology. The primary target of the research center is biologics, a research priority based on data-driven understanding of proteomics, protein regulation, and gene regulation. It involves using biocatalysis and synthetic biology tools to block or supplement the actions of specific cells or proteins in the immune system. Over the past decade, CBIS has produced over 2,000 peer-reviewed publications with over 30,000 citations and currently employs over 200 scientists and engineers. The center is also used primarily to train undergraduate and graduate students, with over 1,000 undergraduates and 200 doctoral students trained. The center also has numerous academic and industry partners including the Icahn School of Medicine at Mount Sinai. These partnerships have resulted in numerous advances over the last decade through new commercial developments in diagnostics, therapeutics, medical devices, and regenerative medicine which are a direct result of research at the center. Examples of advancements include the creation of synthetic heparin, antimicrobial coatings, detoxification chemotherapy, on-demand bio-medicine, implantable sensors, and 3D cellular array chips. Rensselaer also hosts the Tetherless World Constellation, a multidisciplinary research institution focused on theories, methods, and applications of the World Wide Web. Research is carried out in three inter-connected themes: Future Web, Semantic Foundations and Xinformatics. At Rensselaer, a constellation is a multidisciplinary team composed of senior and junior faculty members, research scientists, and postdoctoral, graduate, and undergraduate students. The faculty of each constellation includes three or more outstanding stars in a particular research field. The three professors at TWC are James Hendler, Deborah McGuinness and Peter Fox. Faculty alumni of TWC includes Heng Ji (Natural Language Processing) . In 2016, the Constellation received a one million dollar grant from the Bill & Melinda Gates Foundation for continuing work on a novel data visualization platform that will harness and accelerate the analysis of vast amounts of data for the foundation's Healthy Birth, Growth, and Development Knowledge Integration initiative. In conjunction with the constellation, Rensselaer operates the Center for Computational Innovations which is the result of a $100 million collaboration between Rensselaer, IBM, and New York State to further nanotechnology innovations. The center is currently home to the most powerful private-university based supercomputer in the world and its supercomputer is consistently ranked among the most powerful in the world, capable of performing over 1.1 petaFLOPS. The center's main focus is on reducing the cost associated with the development of nanoscale materials and devices, such as used in the semiconductor industry. The university also utilizes the center for interdisciplinary research in biotechnology, medicine, energy, and other fields. Rensselaer additionally operates a nuclear reactor and testing facility – the only university-run reactor in New York State – as well as the Gaerttner Linear Accelerator, which is currently being upgraded under a $9.44 million grant from the US Department of Energy. In 2018, Rensselaer's enrollment was 7,442 total resident students, including 6,590 undergraduate and 1,329 graduate. Over 71% of Rensselaer's students are from out of state. More than 20% of students are international. Rensselaer students represent all 50 U.S. states and over 60 countries. The undergraduate student to faculty ratio is 13:1. Among the class of 2020, 66% are in the top 5 percent of their high school class, 93% in the top quarter, and 99% in the top half. The average unweighted high school GPA for enrolled students was 3.88 on a 4.0 scale, with 65% having a 3.75 GPA or higher and 99% having at least a 3.0. Rensselaer's yield rate for the Class of 2021 surpassed 20 percent in the year 2018 with over 20,000 applications received by Rensselaer's Office of Admissions. The average SAT score range was 1330-1500 for the mid-50% range with a median SAT score of 1420 on a scale of 1600. The average ACT score range was 29-33 for the mid-50% range with a median ACT score of 31. In 2016, Rensselaer's freshman retention rate was 94% and admissions selectivity rating was 35th in the nation according to the US News & World Report. Roughly 12% of students received the Rensselaer medal, a merit scholarship with a cumulative value of $100,000 for exceptional high school students in science and mathematics. Altogether 95% of full-time domestic undergraduate students receive either need-based or merit-based financial aid, averaging 85% of total need met In 2018, Rensselaer invested over $140 million in financial aid and scholarships for students. In the fall of 2016, more than 1,000 women enrolled in Rensselaer Polytechnic Institute's undergraduate engineering programs for the first time in its history. These women represented 30 percent of the student body in engineering at the university, and 32 percent of the university's total gender composition. Shekhar Garde, Rensselaer's dean of engineering, claims he wants to increase the female composition of the Institute to 50 percent before 2030. Rensselaer Polytechnic Institute has an extensive history of Greek community involvement on campus, including past presidents, honorary academic building dedications, and philanthropic achievements. The overall Greek system at Rensselaer stresses Leadership, Fortitude, Innovation, and Evolution. RPI currently has 29 active fraternities as well as 6 sororities, with 32 percent involvement of all males and 18 percent involvement of all females, organized under the Interfraternal Council and Panhellenic Council. Of those Greek organizations, three were founded at Rensselaer including the Theta Xi national engineering fraternity, the Sigma Delta Hispanic-interest local sorority, and the Rensselaer Society of Engineers local engineering fraternity. Theta Xi fraternity was established by RPI students on April 29, 1864, the only national fraternity founded during the Civil War. The Theta Xi Fraternity Chapter House is listed on the National Register of Historic Places. Additionally, Rensselaer is home to the Epsilon Zeta chapter of the Alpha Phi Omega, or "APO," national service fraternity, which operates a test-bank and office at the top floor of the Student Union. The organization also hosts a campus lost & found, universal can tab collection, and a used book exchange. In 2017, Chi Phi and Theta Chi at Rensselaer co-hosted an event called "Brave A Shave For Kids With Cancer," along with several other Greek organizations - raising over $22,000 for pediatric cancer research with dozens of participants shaving their heads to spread awareness of pediatric cancers. Many fraternities and sororities also engage in Adopt-a-Highway and host events in the local community. Since its inception, all members of Greek Life have also participated in Navigating Rensselaer & Beyond - RPI's official continuation of student orientation through hosting annual events open to all students such as Beach Day/Hike with Greek Life, a day of hiking and team building activities for incoming freshmen, and Saratoga Therapeutic Equine Program, a day of service focused on horse rehabilitation programs. Greek Life organizations also operate Greek-affiliated groups including the Alumni Inter-Greek Council, Greek Greeks - a student-run venture which aims to promote sustainability and safe environmental practices in Greek chapter houses, Greek Spectrum - an LGBTQIA support and advocacy group, and the undergraduate Greek leadership society Order of Omega. Membership in the Order is incredibly selective, with Greek-affiliated members in fraternities and sororities being selected from the top 3 percent of Rensselaer in terms of academics. Members must also demonstrate exemplary leadership within their respective Greek chapter, campus, and the local community as a whole. Greek community members are also involved in hundreds of student clubs and organizations on campus, often holding leadership positions. Many Greek organizations at RPI require involvement in at least one on-campus club or organization to maintain or be considered for membership. The RPI Engineers are the athletic teams for the university. RPI currently sponsors 23 sports, 21 of which compete at the NCAA Division III level in the Liberty League; men's and women's ice hockey compete at the Division I level in ECAC Hockey. The official nickname of some of the school's Division III teams was changed in 1995 from the Engineers to the Red Hawks. However, the hockey, football, cross-country, tennis and track and field teams all chose to retain the Engineers name. The Red Hawks name was, at the time, very unpopular among the student body; a Red Hawk mascot was frequently taunted with thrown concessions and chants of "kill the chicken!". In 2009 the nickname for all teams has since been changed back to Engineers. In contrast, the official ice hockey mascot, known as Puckman, has always been very popular. Puckman is an anthropomorphic hockey puck with an engineer's helmet. RPI has a competitive Division I hockey team who won NCAA national titles in 1954 and 1985. Depending on how the rules are interpreted, the RPI men's ice hockey team may have the longest winning streak on record for a Division I team; in the 1984-85 season it was undefeated for 30 games, but one game was against the University of Toronto, a non-NCAA team. Continuing into the 1985-86 season, RPI continued undefeated over 38 games, including two wins over Toronto. The streak ended at Boston University against the Terriers. Adam Oates and Daren Puppa, two players during that time, both went on to become stars in the NHL. Joé Juneau, who played from 1987 to 1991, and Brian Pothier, who played from 1996 to 2000, also spent many years in the NHL. Graeme Townshend, who also played in the late 1980s, had a brief NHL career. He is the first man of Jamaican ancestry to play in the National Hockey League. The ice hockey team plays a significant role in the campus's culture, drawing thousands of fans each week to the Houston Field House during the season. The team's popularity even sparked the tradition of the hockey line, where students lined up for season tickets months in advance of the on-sale date. Today, the line generally begins a week or more before ticket sales. Another tradition since 1978 has been the "Big Red Freakout!" game held close to the first weekend of February. Fans usually dress in the schools colors red and white, and gifts such as T-shirts are distributed en masse. In ice hockey, the RPI's biggest rival has always been the upstate engineering school Clarkson University. In recent years RPI has also developed a spirited rivalry with their conference travel partner Union College, with whom they annually play a nonconference game in Albany for the Mayor's Cup. The women's ice hockey team moved to the NCAA Division I level in 2005. During the 2008-09 season the team set the record for most wins in one season (19-14-4). On February 28, 2010, Rensselaer made NCAA history. The Engineers beat Quinnipiac, 2-1, but it took five overtimes. It is now the longest game in NCAA Women's Ice Hockey history. Senior defenseman Laura Gersten had the game-winning goal. She registered it at 4:32 of the fifth overtime session to not only clinch the win, but the series victory. 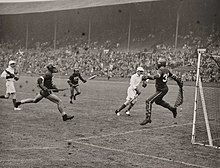 The lacrosse team represented the United States in the 1948 Olympics in London. It won the Wingate Memorial Trophy as national collegiate champions in 1952. Future NHL head coach Ned Harkness coached the lacrosse and ice hockey teams, winning national championships in both sports. The Engineers baseball squad is perennially atop the Liberty League standings, and has seen 8 players move on to the professional ranks, including 4 players selected in the MLB draft. The team is coached by Karl Steffen (Ithaca '78). The Engineers play their home games at the historic Robison Field. American rugby was played on campus in the late 1870s. Intercollegiate football begin as late as 1886 when an RPI team first played a Union College team on a leased field in West Troy (Watervliet). Since 1903, RPI and nearby Union have been rivals in football, making it the oldest such rivalry in the state. The teams have played for the Dutchman's Shoes since 1950. RPI Football had their most successful season in 2003, when they finished 11-2 and lost to St. Johns (Minn.) in the NCAA Division III semi final game. 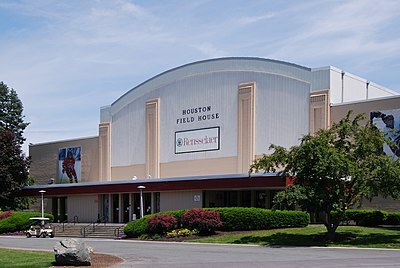 The Houston Field House is a 4,780‑seat multi-purpose arena located on the RPI campus. It opened in 1949 and is home to the RPI Engineers men's and women's ice hockey teams. The Field House was renovated starting in 2007 as part of the major campus improvement project to build the East Campus Athletic Village. The renovations included locker rooms upgrades, addition of a new weight room, and a new special reception room dedicated to Ned Harkness. Additionally, as part of the renovations through a government grant, solar panels were installed on the roof to supply power to the building. As part of the Rensselaer Plan, the Institute recently completed a major project to improve its athletic facilities with the East Campus Athletic Village. The plan included construction of a new and much larger 4,842‑seat football stadium, a basketball arena with seating for 1,200, a new 50-meter pool, an indoor track and field complex, new tennis courts, new weight rooms and a new sports medicine center. The Institute broke ground on August 26, 2007, and construction of the first phase is expected to last two years. The estimated cost of the project is $78 million for phase one and $35–$45 million for phase two. Since the completion of the new stadium, the bleachers on the Class of '86 football field on the central campus have been removed and the field has become an open space. In the future the new space could be used for expansions of the academic buildings, but for now members of the campus planning team foresee a "historic landscape with different paths and access ways for students and vehicles alike". The students of RPI have created and participate in a variety of clubs and organizations funded by the Student Union. About 170 of these organizations are funded by the Student Union, while another thirty, which consist mostly of political and religious organizations, are self-supporting. In 2006 the Princeton Review ranked RPI second for "more to do on campus." The Union was the last entirely student-run union at a private university in the United States until September 2017. Phalanx is RPI's Senior Honor Society. It was founded in 1912, when Edward Dion and the Student Council organized a society to recognize those RPI students who had distinguished themselves among their peers in the areas of leadership, service and devotion to the alma mater. It is a fellowship of the most active in student activities and has inducted more than 1,500 members since its founding. RPI has around twenty intramural sports organizations, many of which are broken down into different divisions based on level of play. Greek organizations compete in them as well as independent athletes. There are also thirty-nine club sports. Given the university's proximity to the Berkshires, Green Mountains and Adirondacks, the Ski Club and the Outing Club are some of the largest groups on campus. The Ski Club offers weekly trips to local ski areas during the winter months, while the Outing Club offers trips on a weekly basis for a variety of activities. The Rensselaer Polytechnic is the student-run weekly newspaper. The Poly printed about 7,000 copies each week and distributed them around campus until 2018 when the newspaper switched to online-only distribution due to budget concerns. Although it is the Union club with the largest budget, The Poly receives no subsidy from the Union, and obtains all funding through the sale of advertisements. There is also a popular student-run magazine called Statler & Waldorf which prints on a semesterly basis. RPI has an improvisational comedy group, Sheer Idiocy, which performs several shows a semester. There are also several music groups ranging from a cappella groups such as the Rusty Pipes, Partial Credit, the Rensselyrics and Duly Noted, to several instrumental groups such as the Orchestra, the Jazz Band and a classical choral group, the Rensselaer Concert Choir. Another notable organization on campus is WRPI, the campus radio station. WRPI differs from most college radio in that it serves a 75-mile (121 km) radius including the greater Albany area. With 10 kW of broadcasting power, WRPI maintains a stronger signal than nearly all college radio stations and some commercial stations. WRPI currently broadcasts on 91.5 FM in the Albany area. 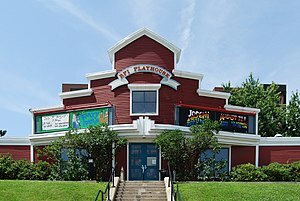 The RPI Players is an on‑campus theater group that was formed in 1929. The Players resided in the Old Gym until 1965 when they moved to their present location at the 15th Street Lounge. This distinctive red shingled building had been a USO hall for the U.S. Army before being purchased by RPI. The Players have staged over 275 productions in its history. "The Alma Mater (Here's to Old RPI)" – sung at formal events such as commencement and convocation, also played and sung by the Pep Band at hockey and football games, and played daily at noon by the quadrangle bell tower. It was published in the first book of Songs of Rensselaer printed in 1913. "Hail, Dear Old Rensselaer" – used to be the fight song during the 1960s. It is still played today by the Pep Band at athletic events. "All We've Learned at Rensselaer" – sung at the RPI commencement ceremonies by the Rensselyrics. Although the Rensselyrics are an a cappella group, this song is accompanied by piano. Each verse or section has a different musical style, several of which are closely based on Billy Joel songs or other popular songs. Another notable aspect of student life at RPI is the "First-Year Experience" (FYE) program. Freshman begin their stay at RPI with a week called "Navigating Rensselaer and Beyond" or NRB week. The Office of the First-Year Experience provides several programs that extend to not only freshman, but to all students. These include family weekend, community service days, the Information and Personal Assistance Center (IPAC), and the Community Advocate Program. Recently the FYE program was awarded the 2006 NASPA Excellence Gold Award, in the category of "Enrollment Management, Orientation, Parents, First-Year, Other-Year and related". Since 2008, Jackson's administration has led an effort to form the CLASS Initiative ("Clustered Learning Advocacy and Support for Students"), which requires all sophomores to live on campus and to live with special "residence cluster deans". The transition to this program began in early 2010 among some resistance from some fraternities and students who had planned to live off campus. According to the Rensselaer Alumni Association, there are nearly 100,000 RPI graduates currently living in the United States, and another 4,378 living abroad. In 1995, the Alumni Association created the Rensselaer Alumni Hall of Fame. Several notable 19th century civil engineers graduated from RPI. These include the visionary of the transcontinental railroad, Theodore Judah, Brooklyn Bridge engineer Washington Roebling, George Washington Gale Ferris Jr. (who designed and built the original Ferris Wheel) and Leffert L. Buck, the chief engineer of the Williamsburg Bridge in New York City. Many RPI graduates have made important inventions, including Allen B. DuMont ('24), creator of the first commercial television and radar; Keith D. Millis ('38), inventor of ductile iron; Ted Hoff ('58), father of the microprocessor; Raymond Tomlinson ('63), often credited with the invention of e-mail; inventor of the digital camera Steven Sasson and Curtis Priem ('82), designer of the first graphics processor for the PC, and co-founder of NVIDIA. RPI Prof. Matthew Hunter invented a process to refine titanium in 1910. In addition to NVIDIA, RPI graduates have also gone on to found or co-found major companies such as John Wiley and Sons, Texas Instruments, Fairchild Semiconductor, PSINet, MapInfo, Adelphia Communications, Level 3 Communications, Garmin, Bugle Boy and Vacasa. Several RPI graduates have played a part in the U.S. space program: George Low (B.Eng. 1948, M.S. 1950) was manager of the Apollo 11 project and served as president of RPI, and astronauts John L. Swigert, Jr., Richard Mastracchio, Gregory R. Wiseman, and space tourist Dennis Tito are alumni. Political figures who graduated from RPI included federal judge Arthur J. Gajarsa (B.S. 1962),and Major General Thomas Farrell of the Manhattan Project. Edward Burton Hughes, the Acting Commissioner of New York State Department of Transportation in 1969, Executive Deputy Commissioner of New York State Department of Transportation from 1967-1970, and Deputy Superintendent of New York State Department of Public Works from 1952-1967. DARPA director Tony Tether, Representative John Olver of Massachusetts's 1st congressional district, and Senators John Barrasso of Wyoming, Mark Shepard of Vermont, and George R. Dennis of Maryland, Prime Minister Hani Al-Mulki of Jordan. Notable ice hockey players include NHL Hockey Hall of Famer and 5-time NHL All Star Adam Oates (1985), Stanley Cup winner and former NHL All Star Mike McPhee (1982), two-time Calder Cup winner Neil Little (1994), former NHL All Rookie Joé Juneau (1991), and former NHL All Star Daren Puppa (1985). Other notable alumni include 1973 Nobel Prize in Physics winner Ivar Giaever (Ph.D. 1964); the first African-American woman to become a thoracic surgeon, Rosalyn Scott (B.S. 1970); director of Linux International Jon Hall (M.S. 1977); NCAA president Myles Brand (B.S. 1964); Lois Graham (B.S.ME 1946), who was the first women to receive a degree in engineering from RPI, and went on to become the first woman in the US to receive a PhD in engineering; adult stem cell pioneer James Fallon; Michael D. West, gerontologist and stem cell scientist, founder of Geron, now CEO of BioTime (1976); director Bobby Farrelly (1981), David Ferrucci, lead researcher on IBM's Watson/Jeopardy! project; 66th AIA Gold Medal winning architect Peter Q Bohlin; Matt Patricia, Head Coach for the Detroit Lions; Garrettina LTS Brown, founder of Garrett's List, King Breeders and inventor of FreeTV; Luis Acuña-Cedeño, Governor of the Venezuelan Sucre State and former Minister of Universities; Andrew Franks, current placekicker for the Miami Dolphins of the National Football League; Sean Conroy, the first openly gay professional baseball player; Prem C Jain (Father of Green Buildings in India). ^ "U.S. and Canadian Institutions Listed by Fiscal Year 2017 Endowment Market Value and Change in Endowment Market Value from FY 2016 to FY 2017" (PDF). National Association of College and University Business Officers and Commonfund Institute. Archived from the original (PDF) on March 6, 2018. Retrieved January 29, 2018. ^ "Professor Prabhat Hajela Appointed Provost". 25 May 2012. Archived from the original on 28 March 2013. Retrieved 25 May 2012. ^ a b "Diversity" (PDF). Lamp14.server.rpi.edu. Retrieved 4 October 2018. ^ "RPI Brand Guidelines" (PDF). 12 June 2015. Archived from the original (PDF) on 24 January 2016. Retrieved 6 January 2016. ^ Symbols of the Institute. Lib.rpi.edu. Retrieved 21 November 2013. ^ a b c Ricketts, Palmer C. (1934). History of Rensselaer Polytechnic Institute, 1824-1934, Third Edition. New York, NY: John Wiley & Sons, Inc. p. 34. ^ "RPI History". Rensselaer Polytechnic Institute. Retrieved 1 May 2009. ^ "Rensselaer in Brief". 2008. Retrieved 22 May 2008. ^ "RPI: Academics". RPI.edu. Retrieved 15 February 2014. ^ "National Universities Rankings". Retrieved 14 October 2018. ^ a b "Rensselaer Polytechnic Institute". Forbes.com. Retrieved 4 October 2018. ^ a b c "Our First Ever College Rankings". The Economist. 2016. Retrieved 21 October 2016. ^ "The Best Colleges for Physics in the United States". collegefactual.com. Retrieved 29 January 2019. ^ "USA Today Ranks Rensselaer 6th Among Top U.S. Colleges To Major in Physics". science.rpi.edu. Retrieved 29 January 2019. ^ Martialay, Mary L. (August 28, 2017). "Physics Program Top Ten in the Country". RPI News. Rensselaer Polytechnic Institute. news.rpi.edu. Retrieved 7 October 2017. ^ a b c d Institute Archives and Special Collections. "RPI Building Histories". Retrieved 21 January 2007. ^ "The Inflation Calculator". Westegg.com. Retrieved 15 February 2014. ^ "CIRCULAR—To the County Clerks of the State of New-York". The Geneva gazette, and general advertiser. James Bogert. Retrieved 17 March 2014. ^ Wicks, Frank (July 1999). "The blacksmith's motor". Mechanical Engineering Magazine. American Society of Mechanical Engineers. Archived from the original on 5 February 2007. Retrieved 28 February 2009. ^ "Timeline of Rensselaer Polytechnic Institute History 1999". Retrieved 21 January 2007. ^ Laws of the State of New York, Volume 1. Albany, NY: State of New York. 1 May 1861. p. 428. ^ "THE GREAT FIRE IN TROY. ; Between Five and Six Hundred Buildings Destroyed. A Number of Persons Killed and Missing". Nytimes.com. Retrieved 4 October 2018. ^ a b Nehrich, John (27 January 2010). "Classic buildings result of citywide fire". Retrieved 2 March 2010. ^ "The Infant School Property". RPI Building Histories. Retrieved 2010-03-02. ^ a b "NEB&W Guide to the History of RPI". September 8, 2004. Archived from the original on 11 January 2009. Retrieved 2009-02-28. ^ a b "President's Report 2016" (PDF). Retrieved 17 March 2017. ^ "FOURTH FIRE AT R.P.I. ; Troy's History Technical School Destroyed in $50,000 Blaze" (PDF). The New York Times. Retrieved 16 March 2014. ^ "RPI Biography of Palmer Ricketts". Retrieved 21 January 2007. ^ "History of RPI's Gaerttner Linear Accelerator". Retrieved 28 February 2009. ^ "RPI's Incubator Program History". Archived from the original on 19 August 2010. Retrieved 5 September 2011. ^ "Academia Linking With Industry: the RPI model". 1989. Retrieved 21 January 2007. ^ Monahan, Torin (2003). "Hot Technologies on Every Pillow". Radical Pedagogy. 4 (1). ^ "No-Confidence Motion Fails at Rensselaer Polytechnic". The Chronicle of Higher Education. April 27, 2006. ^ "RPI faculty approves new constitution". Retrieved 30 December 2008. ^ "For RPI, priorities an issue: Layoffs spark questions about school's spending on construction, salaries". Retrieved 30 December 2008. ^ Mary L. Martialayvar. "Rensselaer Regional Economic Impact More Than $1 Billion Annually". News.rpi.edu. Retrieved 4 October 2018. ^ "North Hall and E-Complex Renovated To Accommodate Largest Incoming Class – Every Day Matters". Insiderensselaer.com. Retrieved 4 October 2018. ^ "Quad undertakes summer renovations". The Polytechnic. Retrieved 4 October 2018. ^ "Rensselaer Polytechnic Institute Virtual Campus Tour". Retrieved 1 March 2009. ^ "Social and Behavioral Research Laboratory". Archived from the original on 11 March 2009. Retrieved 3 March 2010. ^ Institute Archives and Special Collections (2003). "History of The Approach". Retrieved 21 February 2008. ^ Institute Archives and Special Collections. "RPI Building Histories : West Hall". Retrieved 28 February 2009. ^ "Rensselaer Building Histories: Chapel/Voorhees Computing Center". Rensselaer Polytechnic Institute Archives and Special Collections. Retrieved 28 February 2009. ^ "Rensselaer Building Histories: Folsom Library". Rensselaer Polytechnic Institute Archives and Special Collections. Retrieved 7 October 2017. ^ "Mid-century Modern in Troy" [event announcement]. 7 October 2017. DOCOMOMO New York/Tri-State, a local chapter of DOCOMOMO US, national working group of the international organization DOCOMOMO (DOcumentation and COnservation of buildings, sites and neighborhoods of the MOdern MOvement). "The tour will end with the striking Brutalist Folsom Library." Retrieved 7 October 2017. ^ RPI (2006). "Barton Hall Profile". Retrieved 28 February 2009. ^ The Polytechnic (2007). "EMPAC on schedule to open October 2008". Retrieved 9 November 2007. ^ "EMPAC Mission". 2007. Archived from the original on 8 June 2008. Retrieved 21 January 2007. ^ Brunelle, Will. "Report: R.P.I. facing $1 billion in debts, liabilities". Politico PRO. Retrieved 2019-03-05. ^ a b "Rensselaer Unveils Newly Renovated Residence Commons in Downtown Troy". RPI Press Release. 15 May 2009. Retrieved 24 May 2009. ^ "RPI Campus Map". Retrieved 27 February 2010. This interactive map can be used to see the locations of the Rice, Heley and Gurley buildings in Troy. ^ "Columbia Development Companies To Acquire Proctor's Theater and Chasan Building in Troy and Launch Restoration - News & Events". News.rpi.edu. Retrieved 4 October 2018. ^ Young, Elizabeth (8 April 2009). "The Drama Over Troy's Theatre". Albany Times-Union. Hearst Corporation. Retrieved 10 June 2009. ^ "Save Proctor's Theatre advocacy group". Retrieved 27 February 2010. ^ Caprood, Tom (23 April 2009). "A discussion about Proctor's". The Record. Journal Register Company. Retrieved 11 June 2009. ^ "Interdisciplinary Programs". Rensselaer Polytechnic Institute. Archived from the original on 18 June 2009. Retrieved 9 June 2009. ^ "Mobile Computing Program Frequently Asked Questions". Rensselaer Polytechnic Institute. Retrieved 6 April 2010. ^ David M. Ewalt (22 October 2004). "America's Most Connected Campuses". Forbes. ^ "The Rensselaer Plan". 1999. Retrieved 21 January 2007. ^ "Accomplishments of Rensselaer Plan". 2006. Retrieved 21 January 2007. ^ "Freshman Applications for Class of 2022 Surge Past 20,000 at Rensselaer Polytechnic Institute". RPI News. Rensselaer Polytechnic Institute. March 28, 2018. Retrieved May 6, 2018. ^ "Board of Trustees Enthusiastically Endorses Leadership and Presidency of Dr. Shirley Ann Jackson". 2006. ^ Arenson, Karen W. (13 March 2001). "For Rensselaer Polytechnic, a Record-Setting Gift With No Strings Attached". The New York Times. Retrieved 8 March 2007. ^ "Historic Rensselaer Capital Campaign Reaches Goal Nine Months Ahead of Schedule" (Press release). RPI. October 1, 2008. Retrieved 3 March 2010. ^ "New capital campaign coming in 2017". Retrieved 17 March 2017. ^ "2018 National Universities Rankings". US News & World Report. Retrieved January 29, 2018. ^ "2017 College Guide and Rankings". Washington Monthly. Retrieved 4 October 2018. ^ a b "Rensselaer Polytechnic Institute". Times Higher Education (THE). Retrieved 4 October 2018. ^ "Rensselaer Polytechnic Institute". Topuniversities.com. 16 July 2015. Retrieved 4 October 2018. ^ U.S. News & World Report (2016). "America's Best Colleges 2016". Retrieved 12 September 2010. ^ "2016 National Universities Rankings". US News & World Report. Retrieved September 13, 2016. ^ "Polytechnic article on financial statistics aids". 2016. Archived from the original on 16 July 2011. Retrieved 16 October 2009. ^ "Ratings & Rankings". Rankings. Archived from the original on 6 June 2011. Retrieved 2 March 2016. ^ a b "U.S. News & World Report guide to "America's Best Graduate Schools"". 2016. Archived from the original on 6 May 2007. ^ "The Top 200 World Universities". Times Higher Education. 2016. Retrieved 12 June 2016. ^ "The Top 50 Universities for Technology". Times Higher Education. 2007. Retrieved 12 May 2009. ^ "The World's Best Engineering Schools". Business Insider. 2012. Retrieved 16 July 2012. ^ "America's 25 New 'Ivies'". 2006. Archived from the original on 14 July 2011. Retrieved 5 September 2011. ^ "Undergraduate Specialty Program Rankings". 2008. Archived from the original on 1 May 2008. ^ "Reputation". Retrieved 17 March 2017. ^ "Rensselaer Polytechnic Institute". Retrieved 17 March 2017. ^ "Research Priorities". Retrieved 26 January 2008. ^ "Office of the Vice President for Research". Retrieved 17 March 2017. ^ "Center for Biotechnology and Interdisciplinary Studies". Retrieved 17 March 2017. ^ "The Center for Biotechnology & Interdisciplinary Studies at Rensselaer". Retrieved 17 March 2017. ^ "Industry Partners Program". Retrieved 17 March 2017. ^ "Rensselaer Data Project Addresses Childhood Stunting in Developing Nations". News.rpi.edu. Retrieved 17 March 2017. ^ "Lawrence Livermore National Laboratory and Rensselaer Polytechnic Institute Agree To Jointly Promote Adoption of High Performance Computing". Cci.rpi.edu. Retrieved 17 March 2017. ^ "Addressing Complex Global Challenges Through Multidisciplinary Collaboration: School of Engineering Reflects on NASA Juno Mission and Role of Research Center in the Modern Rensselaer Experience". RPI News. Rensselaer Polytechnic Institute. news.rpi.edu. October 21, 2016. Retrieved 7 October 2017. ^ "President's Report 2016" (PDF). Retrieved 17 March 2017. ^ "Common Data Sets - Office of the Provost". 2 August 2014. Archived from the original on 2 August 2014. Retrieved 4 October 2018. ^ a b "Facts & Figures". Retrieved 17 March 2017. ^ a b "College Navigator - Rensselaer Polytechnic Institute". Nces.ed.gov. Retrieved 14 March 2014. ^ "RPI Annual Report FY2018" (PDF). renewrensselaer.org. Retrieved 5 November 2018. ^ "Greek Organizations, Residence Life, Rensselaer Polytechnic Institute". Reslife.rpi.edu. Retrieved 4 October 2018. ^ "RPI 2017 - Theta Chi and Chi Phi - A St. Baldrick's Event". Stbaldricks.org. Retrieved 4 October 2018. ^ "E to the X". RPI Information. Retrieved 4 September 2011. ^ "Witness's recollection of the cheer originating at RPI". Lanuguagehat.com. Retrieved 2 March 2010. ^ "RPI Hockey FAQ". Retrieved 3 March 2010. ^ "At the beginning of the Hockey Line". RPI History Revealed. 8 September 2009. Archived from the original on 18 July 2011. Retrieved 8 March 2010. ^ Women's Hockey Headed to ECAC Hockey Semifinals. RPI Athletics. Retrieved 21 November 2013. ^ "Timeline of RPI History-1959". Retrieved 21 January 2007. ^ DiTursi, Dan (2004-01-14). "Football 2003: A season to remember". Retrieved 18 February 2009. ^ "Houston Field House Renovation" (PDF). Retrieved 10 September 2008. ^ "Giving to Rensselaer Polytechnic Institute - Athletics". Retrieved 5 September 2011. ^ "Rensselaer Breaks Ground for East Campus Athletic Village; First Phase to be Completed by Fall 2009" (Press release). RPI. September 4, 2007. Retrieved 3 March 2010. ^ "East Campus Athletic Village on Schedule for Fall 2009". Archived from the original on 11 January 2009. Retrieved 20 December 2008. ^ The Polytechnic (2 August 2007). "Master Plan Undergoes Public Review". Archived from the original on 16 July 2011. Retrieved 2 December 2007. ^ "Rensselaer Union: Clubs and Organizations". Rensselaer Student Union. Retrieved 27 February 2010. ^ RPI press release (2006). ""Princeton Review ranks RPI 2nd for "Most to do on Campus"". Retrieved 21 January 2007. ^ "Our Union no longer student-run". The Polytechnic. Troy, NY. 2018-09-05. Retrieved 2018-09-18. ^ "Phalanx". Retrieved 9 October 2007. ^ "Phalanx Honor Society". Retrieved 30 September 2014. ^ "Rensselaer Outing Club website". Archived from the original on 30 April 2010. ^ "The Polytechnic Homepage". Archived from the original on 21 January 2007. Retrieved 21 January 2007. ^ "Statler & Waldorf". Retrieved 26 May 2008. ^ "Sheer Idiocy Homepage". Retrieved 9 February 2016. ^ "Duly Noted A Cappella". Retrieved 2 February 2009. ^ 91.5 WRPI - The Upstate Underground - RPI College Radio - Troy, NY. Wrpi.org. Retrieved 21 November 2013. ^ "RPI Players History". Archived from the original on 25 January 2012. Retrieved 18 May 2010. ^ "RPI Songs". RPI Archives and Collections. Retrieved 2 March 2010. ^ "Songs". Stutt.net RPI Information. Retrieved 5 September 2011. ^ "About FYE". Archived from the original on 18 February 2007. Retrieved 23 February 2007. ^ "Rensselaer's First-Year Experience Program recognized Among the Best in the Country". Archived from the original on 4 March 2007. Retrieved 23 February 2007. ^ "Rensselaer's CLASS Program: a Transformation in the Making". Inside Rensselaer. 5 December 2008. Archived from the original on 27 May 2010. Retrieved 25 February 2010. ^ "Housing grant policy changes announced". Retrieved 19 February 2010. ^ Lottman, Kelley (17 February 2010). "Housing policy not quite there". The Rensselaer Polytechnic. Retrieved 25 February 2010. ^ Graduate's Guide to Alumni Resources. Rensselaer Alumni Association. 2010. ^ a b "Rensselaer Alumni Hall of Fame". Retrieved 22 May 2010. ^ "Alumni Hall of Fame : Allen B. Du Mont". RPI. Retrieved 2 March 2010. ^ "Alumni Hall of Fame: Keith D. Millis". RPI. Retrieved 2 March 2010. ^ "Alumni Hall of Fame: Marcian E. Hoff". RPI. Retrieved 2 March 2010. ^ "Alumni Hall of Fame: Raymond S. Tomlinson". RPI. Retrieved 2 March 2010. ^ "The Rediff Interview/Steven J Sasson, inventor of the digital camera". Rediff.com India Limited. ^ "Alumni Hall of Fame: Ivar Giaever". RPI. Retrieved 2 March 2010. ^ "Alumni Hall of Fame: Myles Brand". RPI. Retrieved 2 March 2010. ^ Tracey Leibach, "Why is this man smiling? Baker, Ray Palmer (1924). A Chapter in American Education: Rensselaer Polytechnic Institute, 1824-1924 (PDF). New York, NY: Charles Scribner's Sons. OCLC 1982907. Greene, Benjamin Franklin (1855). The Rensselaer Polytechnic Institute: Its Reorganization in 1849-50, Its Condition at the Present Time, Its Plans and Hopes for the Future (PDF). Troy, NY: D.H. Jones & Co. OCLC 41976314. Nason, Henry B. (1855). Biographical Record of the Officers and Graduates of the Rensselaer Polytechnic Institute, 1824-1886 (PDF). Troy, NY: D.H. Jones & Co. OCLC 1675616. Phelan, Thomas; D. Michael Ross; Car Westerdahll (1995). Rensselaer: Where Imagination Achieves the Impossible. Rensselaer Polytechnic Institute. OCLC 33427362. Rezneck, Samuel (1968). "Education for a Technological Society: A Sesquicentennial History of Rensselaer Polytechnic Institute" (PDF). Troy, NY: Rensselaer Polytechnic Institute. OCLC 33427362. Ricketts, Palmer C. (1934). History of Rensselaer Polytechnic Institute, 1824-1934, Third Edition (PDF). New York, NY: John Wiley & Sons, Inc. OCLC 3050727. Wikimedia Commons has media related to Rensselaer Polytechnic Institute. "Rensselaer Polytechnic Institute" . Encyclopedia Americana. 1920.